I'm evaluating Revit MEP at the moment. Unless I'm missing something, I'm not too impressed with the basic structure presets and manipulation so I've been using Inventor to quickly throw a structural frame together then importing into Revit. My question is how do you go about designing a building? Do you use multiple programs? 1) Inventor - the structural frame (basic as possible, mainly standard PFC and Beams mitred to suit); the floor slabs; custom components not to be repeated. Is this common? My boss would ideally prefer we had an all in one solution. I've made an extreme sideways step in my career from manufacturing design (using Inventor) to these building services type drawings recently so, without meaning to sound daft, I'm asking myself "maybe I am making an arse of this?" . The entire building can be done in Revit. If you are not happy with the out of the box options which are fairly limited, custom families can be found on the internet from manufacturers and users alike. I see a lot of people getting very frustrated with Revit because they want everything all at once but there is a need to build a decent library of families that are tailored for your use. How far can you get with AutoCAD before you need to start building a block library? 1. I'm not moaning about libraries and families, I'm not daft and I don't expect a magic solution (even if the powers that be do). I understand I'll need to detail my own 'library'. I'm asking if I 'should' be able to easily detail structural frames etc in Revit 'MEP' or should I be using Revit Structure (or as I'm doing just now, Inventor). 2. I'm looking for someone to comment on the processes they go through to create these drawings, if they use several programs. I am not very familiar with using Revit Structure but it is included with the top level Revit suite. I have worked with structural models linked into MEP from a couple different sources, so it is being accepted in the industry. If you're using Inventor then you're doing it all wrong. Keep it all in Revit. I believe Revit MEP already has the majority of structural framing components and families pre-installed. Granted, you don't have all the feature that Revit Structure has but you can get very far. Just can't do any analytic data or truss design or anything "structure specific". 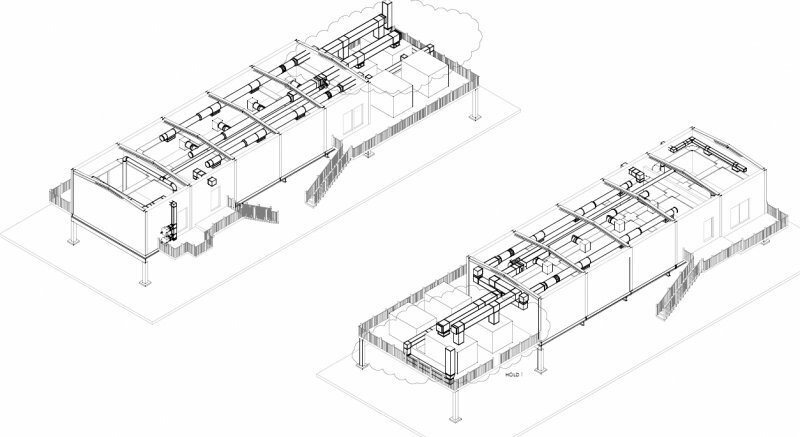 Revit in more than capable of handling all your needs when reconstructing a building. If you have the need for very accurate detail, then you'll want to add Revit Architecture and Structure to the mix. But all MEP design needs are your basic structural, wall, floor and misc. arch details (windows, doors, glazing, etc) laid out. RMEP gives you all that capabilities and then some. Revit MEP does not allow you to place Structural families (columns, framing, joists, etc). We use Building Design Suite Premium which gives us all the tools (RAC2012, RMEP2012, RST2012, and Revit 2013 (all inclusive)) we need for very little more upfront cost. Really? I thought I have before. Then again I have the suite so I could be wrong. I know I've been able to manipulate structural components once in place using Revit MEP. Once the components are in place, you can modify them all you want. You just cannot copy them or place new components. You CAN place structural elements in family editor though. Then bring the family into your project. I once built an entire building structure within family editor...then we upgraded to BDSP. I've fought with it a lot in the past. Lee Roy, thanks so much for confirming my sanity. I have received a quote for the Building Design Suite also, in terms of additional costs it is minimal so I'll just go with that. I'm assuming, after modelling the structure using RST, I'll somehow be able to link within the file for auto updating etc? Like an xref almost? Can you recommend any websites or articles to help 'understand' the process? I'm struggling to find any documentation. Sometimes I feel Autodesk are awesome at saying "and you could do this fancy thing! *insert pretty rendered image here*" but not actually telling you how you go about it. Our reseller is absolutely useless as well, perhaps because we're a small fish and only buying one license. Yes, you can Link Revit models and it works just like XREF's do in AutoCAD (in principle).